Today's guest post comes from Michael Bonner, an adjunct professor of 19th-century history at the University of Arizona. Here, Bonner considers the "paranoid style" rhetoric of Glenn Beck, conservative radio and TV commentator, and slave-power conspiracy theorists in the 1850s. Fox News host Glenn Beck has accumulated enough public prestige, through widespread media exposure, to alter the nation’s political dialogue. How did Beck evolve into such a potent source of political opinion? It is the style of delivery, not the message, that drives Beck’s success. Beck is a master practitioner of the “paranoid style.” (More on that below.) This is not a new approach to building a political base nor is it confined to either the right or left. To simply compare Beck’s popularity with other right-wing examples of the paranoid style would be pointless. However, to analyze Beck’s success alongside the most revered American progressives, abolitionists in the 1850’s, will show that, not only is the “paranoid style” a recurrent theme in American political thought, but implementation of a similar rhetorical strategy made both Beck and creators of the “slave power conspiracy” powerful voices in their respective political dialogues. Columbia University historian Richard Hofstadter spelled out this phenomenon in The Paranoid Style in American Politics (1952), and defined it as “a way of seeing the world and of expressing oneself” that included a “feeling of persecution . . . [and] grandiose theories of conspiracy.” The paranoid style is constructed from several foundational themes. First, one must believe in “the existence of a vast, insidious, preternaturally effective international conspiratorial network designed to perpetrate acts of the most fiendish character,” and society is at war with “a vast and sinister conspiracy . . . set in motion to undermine and destroy a way of life.” Second, paranoid stylists are incredulous about others’ sincerity—opposing arguments, they think, are not based on reasonable deliberation, but must originate from some other source. As a result, they tend to believe that “history is a conspiracy, set in motion by demonic forces of almost transcendent power,” which cannot be conquered by “the usual methods of political give-and-take,” but instead require the constant efforts of “an all-out crusade.” The final element of the paranoid style is what Hofstadter called the “conclusive jump.” After compiling sufficient circumstantial evidence, its practitioners are ready to weave the proof into a conspiracy theory. This is the paranoid style’s weakest aspect and one that critics successfully attack when deconstructing conspiracy theories. Hofstadter declared, “what distinguishes the paranoid style is not . . . the absence of verifiable facts (though it is occasionally true that . . . the paranoid occasionally manufactures them), but rather the curious leap in imagination that is always made at some critical point in the recital of events.” The willingness to interpret issues based on far-flung dubious evidence, or the “conclusive jump,” appears illogical to objective onlookers. Still, it symbolizes the essence of the paranoid style. Far from being a moribund historical curiosity, the paranoid style is alive and well on television and the radio. 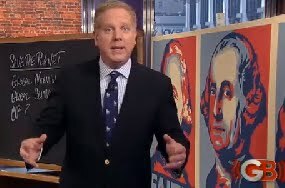 A close inspection of the May 13, 2010 Glenn Beck show serves as an excellent example. Beck called this episode “Crime Inc.” and discussed the impending authoritarian global government. He used an “umbrella” analogy to describe several allegedly interconnected leaders motivated by the doctrines of United Nations functionary Maurice Strong. Beck focused on a 1990 television interview in which Strong said, “isn’t the only hope for the planet that the industrialized civilizations collapse? Isn’t it our responsibility to bring that about?” Next, Beck listed the “small group” bent on global “control,” which included a variety of progressives: John Holdren, Jeremiah Wright, Anita Dunn, Andy Stern, and Donald Berwick. Beck compiled a series of similar views, expressions, and comments and masterfully represented them as conspiratorial evidence, ready for interpretation through the paranoid lens. The Fox host asked viewers to fall-in with his interpretation of alleged proof and affirmed the conclusive jump by reminding viewers they were looking for “a small group, that . . . will collapse the industrialized system.” It is the delivery of information, not the content, which makes Beck such a powerful political rhetorician. Any single argument in the chain of evidence could be disputed as out-of-context, one-sided, and at times absurd, but when carefully constructed to fit specific ends, the collection of otherwise unusual evidence evolves into a plausible conspiracy. Glenn Beck uses a strikingly similar rhetorical strategy that anti-slavery leaders employed in the 1850’s. Abolitionists symbolized the most radical element of the fledgling Republican Party and struggled to advance immediate emancipationist views against competing party platforms of nativism, prohibition, and free labor. Politically active abolitionists conceptualized the slave power conspiracy to demonize southern Democrats, increase their power within the Republican Party, win popular support, and provide a foundation for Republican unity. Ample circumstantial evidence existed for the slave power thesis, and using that evidence proponents accumulated political power out of proportion to their numbers. David Brion Davis writes: “It was a fairly small group of men—scarcely over twenty-five or thirty-who first delineated the Slave Power in speeches, articles, and books,” but their concept greatly influenced the mainstream Republican political rhetoric of William Seward, Charles Sumner, and, to a degree, Abraham Lincoln. Thus the paranoid style assisted Republican growth in the 1850’s and enhanced the power of immediate abolitionists over the party’s rhetorical strategy. Objective thinkers realized there was no Slave Power Conspiracy, which was determined to take over the world in the 1850’s. Today, there is no global shadow government bent on the destruction of industrialized nations. The paranoid style makes sense of Beck’s TV and radio rants. A misuse of evidence is not a right-wing phenomenon, but a historical style adaptable to rhetorical strategies on both the right and left. It is not Beck’s message or compilation of evidence that make his arguments appealing to audiences, but the content’s organization and delivery. From a long-term historical perspective, Beck is not unique but simply a professional purveyor of the paranoid style. 1. Richard Hofstadter, The Paranoid Style in American Politics (Vintage Books, New York, reprint 2008), 4, 14, 29, 37. 2. Quoted material from May 13, 2010 “Glenn Beck” television program on the Fox News Channel. 3. David Brion Davis, The Slave Power Conspiracy and the Paranoid Style (LSU Press, Baton Rouge, 1969), 62. It seems to me this thesis breaks on the rock of the Kansas-Nebraska Act, and what followed it. With that act, Southern slaveholders REALLY DID overturn thirty years of law to spread slavery to the West. They REALLY DID pressure the president to back a pro-slavery government in Kansas. They REALLY DID rewrite history in the Dred Scott decision. These weren't paranoid Northern fantasies; they happened. It is no accident that the abolitionists were largely ignored in the North, but that the Kansas-Nebraska Act galvanized the North's great thinkers, including but certainly not limited to Abraham Lincoln, as well as a majority of Northerners, to oppose this dramatic power grab. I have agree with "hcr". Well said. I would add with the 3/5 of the enslaved population counted for representation in the U.S. House of Representatives, the slave states held more political power in proportion to their political numbers. Perhaps it was not a "conspiracy", but there was definitely a pro-slavery power block. HCR there never was a plan to build massive slave plantations in the territories on the part of the South. This was another piece of fiction invented by anti-southern bigots who really did not want blacks in the territories period. What few slaves that would have migrated with their masters would have been those who wouldn't have accepted freedom had it been offered, house slaves and such. There would not have been a "spread of slavery" as such because the actual number of slaves would have remained the same. Their disbursement simply would have changed. The real conspiracy was that of certain northern power brokers to destroy the sovereignty of the States. Lincoln was a great pick to carry out that task.